This is an innovative product which offers several desktop solutions in one compact package. If both sections are folded down (over the keyboard) you have an 17.5" x 8.5" writing surface. If you fold up the larger (clear) section, you have access to your keyboard with an optical mouse bridge (4.75" x 8.5") over your numeric keypad. There is a 9.5" wide paper slot to allow you to use the reverse of the large clear section as a document holder. If you do need access to the numeric keypad, you can flip up the smaller black section, leave the large clear section down if you are working on accounting tasks requiring a writing surface and a numeric keypad. A line guide is also included. Product may not be as appeared as manufacturer varies their method of production. Note: We do not offer a warranty or 30 day customer satisfaction guarantee on this product as it is acrylic and there have been quality control issues. Triple-decker writing platform raises from sitting to standing heights. Transforms a flat surface into an ergonomic desk. Sets up in seconds almost anywhere. Flexible to suit your needs. A back-saver for office workers, teachers, students, and writers. * Twelve adjustment angles promote better posture and enhance comfort while reading and writing. * Handcrafted in the USA of durable hardwood ply. * Non-glare, low-contrast polyurethane finish is easy on your eyes. * Smooth writing surface is easy on your forearm and wrist. * Thick, centered bottom ledge holds books, binders, papers and pens. The center of the ledge (about a 10" length) extends out 3/4" to support thick books. The ledge tapers down on the sides so as not to interfere with your arms when writing. * Non-skid, non-mar rubber feet protects desktop. * Folds flat for storage. The DocuRite Multi-Position Document Holder and Writing Slope from Posturite combines the functions of an inline document holder and writing surface. It is placed centrally, directly in front of the user between the keyboard and monitor. The large surface (19.5" W x 12" D) provides plenty of space on which to store documents for easy access and notation. A lever-operated eccentric cam system lets the angle be increased by elevating the rear to three different heights. In addition a "stepped" front edge accommodates 4 levels of cantilever over the front edge of the desk for locations where a keyboard tray is in use. This offers further options for increasing the angle of the document surface as well as permitting the writing surface to be drawn almost three inches closer. The DocuRite is made of 5mm thick acrylic which creates a firm writing surface with a frosted finish that ensures potential for glare is reduced. The lightweight construction also means the DocuRite can be easily repositioned as needed. A padded wrist rest doubles as a document ledge. If overreaching is a concern the MultiRite, also from Posturite, permits the entire writing surface to be drawn forward over the keyboard, positioning the materials directly in front of the user and providing support for the hand and arm when writing, thereby reducing the strain on the shoulder. 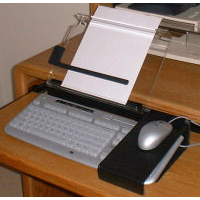 The Microdesk MINI Document Holder and Writing Surface provides an elevated secondary work surface directly between the keyboard and the monitor. 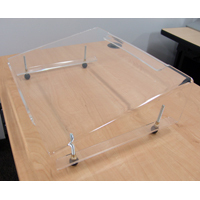 Formed from one continuous piece of transparent, heavy-duty Acrylic plastic, the Microdesk MINI is designed to straddle the rear edge of the keyboard, creating a stable, sloping platform for hand-writing tasks, as well as support for documents, books, mobile devices and other workstation essentials such as calculators or sticky notes. By allowing simultaneous inline access to materials and to the keyboard, this multi-function accessory enhances workstation comfort and convenience. Users can avoid the discomfort of twisting to the side, or of reaching over the keyboard to write; or the inconvenience of having to move the keyboard aside whenever they want to jot down notes. 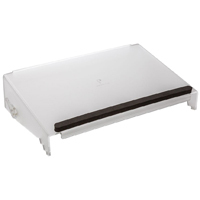 The Microdesk MINI is intended for use with Compact Keyboards and will accommodate keyboards up to approximately 13.5" in width. The adjustable legs offer 2" of height adjustment that enables users to adjust both the angle and elevation of the writing/document surface. The Microdesk MINI offers a minimum of 2.75" of clearance at the front of the writing surface. The Document Ledge is 0.75" high and 10" wide to minimize interference with writing.